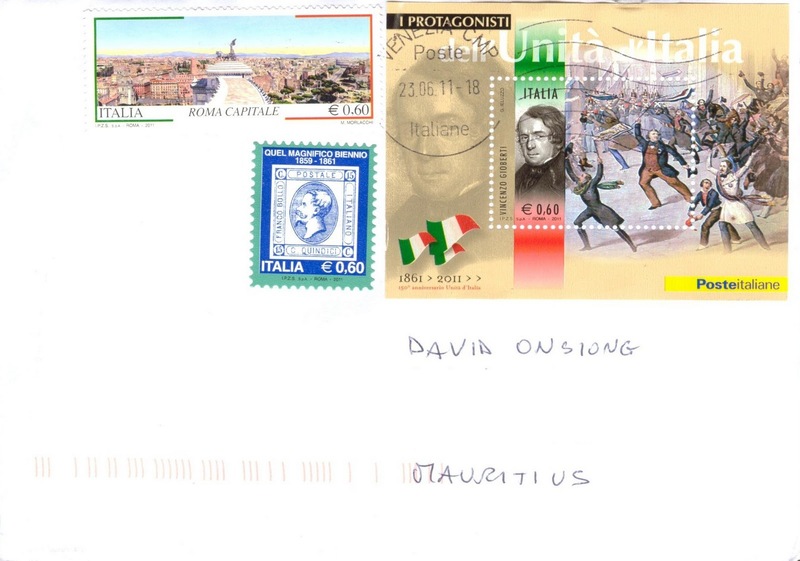 Poste Italiane decided to mark the 150th anniversary of the Unification of Italy by issuing, on June 2, 2011 a set of 8 miniature sheets - besides the one issued jointly with San Marino - each portraying a main figure who took part in this unification. Ivan kindly sent me the one dedicated to Vincenzo Gioberti (1801-1852). Gioberti was educated by the fathers of the Oratory with a view to the priesthood and ordained in 1825. Partly under the influence of Mazzini, the freedom of Italy became his ruling motive in life. His semi-political works, increased by other occasional political articles, aided in drawing the liberal clergy into the movement which has resulted since his time in the unification of Italy. The stamp on the left illustrates the 15-centesimo (1/100th of Italian lira) stamp with the effigy of Vittorio Emanuele II issued in 1863 and the first to appear with the indication "ITALIANO". Vittorio Emanuele II assumed the title King of Italy to become the first king of a united Italy in 1861 until his death in 1878. The Italians gave him the epithet Father of the Fatherland. The words: "Quel Magnifico Biennio", meaning That Magnificent Period, refer to the unification of Italy. The stamp on the upper left of the cover is about the capital city of Italy, Rome. This stamp, featuring, within a linear frame portraying the colours of the Italian flag, the work of Marcella Morlacchi entitled "Roma dalle Quadrighe del Vittoriano: dal Quirinale al Colosseo" and created in 2008, was issued on April 21, 2011 to celebrate Rome as the capital city. The Monumento Nazionale a Vittorio Emanuele II (National Monument to Victor Emmanuel II) is depicted in that art work and is a monument built to honour Vittorio Emanuele, the first king of a unified Italy as said earlier. The monument also holds the Tomb of the Unknown Soldier with an eternal flame, built under the statue of Italy after World War I following an idea of General Giulio Douhet.